This is probably going to seem a little sad, but one of my favourite moments in the working day is when the new mail comes in. First moment of excitement is actually going to my pigeon hole and seeing mail in there. This doesn't happen every morning. And then, the real fun begins, because I get to open it and stamp it with the "Received" date stamp. There is something so satisfying about using this stamp. It reminds of when I was little and we would trail into the bank behind my mum. The tellers used to have what seemed like about three or four different stamps on a cute little roundabout holder and they'd stamp them all on the deposit/withdrawal slip with immense gusto. It all seemed so official and important. And they were always so quick and efficient with the stamping, and the counting out of the money over the counter. It was impressive. Anyway, if you were really lucky they'd also stamp one on your hand as a treat. The only thing better than this for a child going shopping was when the butcher would give you a free handful of cheerios. I wonder if butchers still do this? Okay...so it's a pretty bad photo which doesn't give you any idea of the immense size of the ring on my finger, but let me tell you...it's huge. 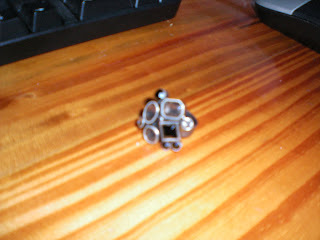 It's also heavy, weighing down my finger as I'm typing this fascinating post...so it's doubtful that I'll ever wear it out of the house (save for very special occasions that require tacky jewellry). Still, what's a birthday if you can't treat yourself to a piece of inappropriate and worthless junk that will give you an hour or so of childlike joy and then be put away in a drawer somewhere, never to see the light of day again? 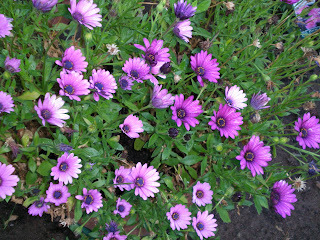 Purple daisies...these self seed so although they are growing in a pot I should have a wonderful crop appear next year. Purple violas...these grew from one seedling mixed into what I very optimistically call the herb garden. Note the rosemary making its way through the flowers. 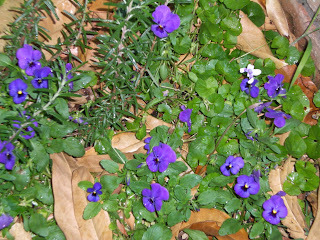 There's native violet in there too which is a wonderful groundcover for part shade. And my favourite...lavender. Two weeks ago there were no flowers to be seen and then suddenly the bushes are covered in buds and new growth. 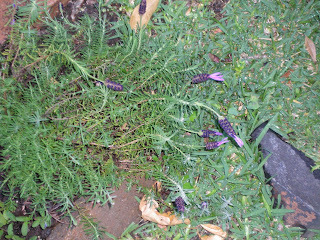 I just wish the climate was a little more helpful...the humidity in summer isn't kind to lavender. There was a whole lot going on in this episode...some of it not particularly understood by me. What was important though was pretty clear. Davros and the daleks are back and they're not happy. No-one could find the Doctor and Donna because for some reason they had nicked off to a distant planet/place/ something where ladies with unusual eyes could tell them what they quickly also worked out for themselves. And the various companions were brought together by the brave ex-PM to find the Doctor and get to saving the world. It was fast, furious and all round entertaining and next week's finale looks like being a cracker. (I thought it was stupid when Rose and The Doctor did the romantic running towards each other thing...but the romantic cliche-a-rama was nicely undercut when the Dalek took out the Doctor at the last moment). Yes it is a little strange that the Prime Minister who appointed Tim Flannery as Australian of the Year would then not meet with him during his reign. (Hmmm not sure "reign" the right word choice - "tenure" maybe). I know Andrew Denton gets a lot of praise for his interviews but there is just something about his style that makes me uneasy. You can see him trying too hard to direct the conversation sometimes. He hasn't got the easy geniality of good old Parky (in my humble opinion anyway). A thankful about face for The Hollowmen, returning to something like its form before last week's episode. I wonder how many Howard government people (is "apparatchik" the word to use here?) were cringing as they watched The Hollowmen deconstruct the war on terror before our very eyes. "We want people to be scared, but also feel confident enough that we will keep them safe" - or something to that effect. That's how you win elections people!!! Well feck, arse and drink! Craggy Island was plunged into mourning as Father Jack was pronounced dead after drinking a bottle of furniture polish. Into the mix add Mrs Doyle with her plate of sandwiches, a nun and a sleepover for Ted and Dougall in the morgue after inheriting Jack's half a million pounds. Jack rising from the dead while Dougall wondered if there was indeed an afterlife made for some satisfying Friday night viewing. Time travel has been a recurring theme for me over the last few weeks in literature, film and television. I'm sure there are many people who have made careful study of this field of inquiry, but my blog description does promise "ill-formed opinion" so I hate to disappoint. Doctor Who of course has been a highlight of the television viewing week and sadly comes to a close this Sunday evening. Last weekend I finished watching my way through the Back to the Future trilogy on DVD. And this week I finished reading The Eyre Affair. I don't know if this recent focus on time travel says anything specific about me at this point in time, but it is interesting to think about the various uses of time travel as a device in fiction. Based on this very small sample of three texts I'm prepared to make a sweeping generalisation that the British time travellers are altruistic. They're all about saving the world, setting wrongs to right for the future of the human race. There's always a bigger picture at stake, combined with the personal stories of the protagonists. Whereas with Back to the Future, time travel is a rather more selfish mechanism, for individual fulfilment. Sure it can spin the world on its axis as well, but really the main motivation for the characters seems to be to set the own personal worlds back heading the right direction. While there was a lot of talk about "disrupting the space-time continuum" and the dire effects this could have for society, you never really get the sense that this is a priority. It's more important for Marty and the Doc to keep their family histories in line so their own peaceful futures are secured and they can go on living the American dream. Perhaps it's simply a question of emphasis, and it's most likely not a national distinction at all. How nice! Our Foucault reading group presentation has been mentioned at this Foucault blog. In spite of many and varied forms of procrastination (some of it occurring through this blog - Nigel Kennedy playing the Doctor Who theme I'm looking at you) I have finished my marking for the term. Just got to finalise the marks spreadsheet and send it away to the course coordinator and then I am free, free, free. What a great feeling. Well tomorrow morning I am going to sit down and write a big list of things I want to get done over the non-teaching term. I imagine most of them will be focussed around a little thing called THE BOOK. As you can see from the link below on the right hand side I am trying out Twitter. I'm not convinced that I really need another online presence apart from this blog and facebook but suddenly everywhere I look I'm reading about "twittering" so I'll give it a trial and see what I think. If anyone else has tried it with varying degrees of success I'd be interested to hear about it. Gardening before breakfast. It's a little bit radical (for me anyway) but it just seemed like a beautiful morning and I woke up earlier than usual. It was wonderful to get outside in the fresh air before they day began. 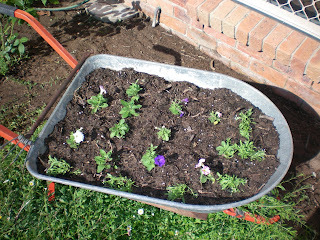 It's pretty twee I suppose - using an old wheelbarrow to plant annuals, but I don't care. These are something called junior petunias, a petunia but just a smaller bloom, surrounded by some pink alyssum. I'm hoping they'll grow as well as the last seedlings (which I finally pulled out on Sunday well past their use by date). 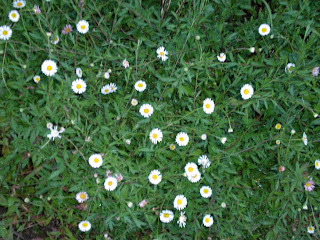 And this is my favourite thing in the front garden at the moment. 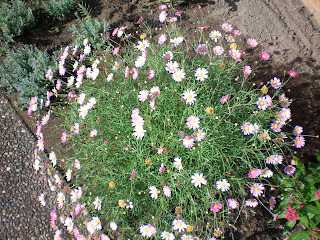 It's a pink daisy bush that despite weeks of almost complete neglect is flourishing. ....I asked my good friend and colleague Jinx as we were handed the latest thing in university marketing while we innocently sat chatting earlier today. ....with a cute little logo for one our regional university programs here. I'm actually a little lost for words on this one. I have now updated my previous post on our Foucault talk. Well the wind has finished sweeping down the plains, the corn has been cut down and the mornings are a little less beautiful. 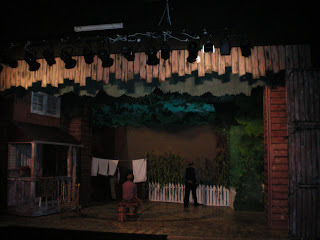 That's right, Oklahoma has completed its run at the Playhouse theatre and this morning, all around town there are people waking up wondering just what they used to do on Tuesday, Thursday evenings and Sunday afternoons. The 10 week rehearsal period is rather intense. And people who have never felt the inclination to be involved are often bemused by the dedication and willingness of others to be take part in such events. When you're involved in a project like this you get swept up in it, you live and breathe it for a couple of months. You see the same people many times a week, chatting, laughing and, yes, sometimes griping. You're part of a team all working towards a common goal and that's a good, and often exciting feeling. Then, of course there's the adrenalin rush of the performances, the nerves, the tension, and the joy when it all goes well and audiences laugh and enjoy themselves. And, then it's over and we all return to our everyday lives, but it's the memories of the great times that keep people returning to the theatre...so they can experience it all over again. The theatre brings people together in a positive way, and that's a wonderful thing to be part of. I loved this episode so much, I think particularly because it focussed on Donna. Such clever writing and ideas here clearly leading towards the series finale I imagine. It was great to see Donna's transformation, even without the Doctor by her side, with the help of Rose. Donna's face when she realised she was going to die was amazingly poignant and her heroism and bravery was inspiring. I'm raving I know, but I just enjoyed it so much. Sadly for me this was the last episode in this fascinating series about people building often grand and unusual houses. The host Kevin McCloud is frequently brutal in his honesty, fearlessly commenting on the problems with design, project management or the all round "build". Most interesting are the couples who choose to be very hands on, although those who employ others to get their hands dirty are often fascinating as well. Perhaps the most memorable episode for me was when Damien Hirst built a Shaker style summer house at the bottom of his garden, while his wife renovated a houseboat on the Thames. The other one that springs to mind was when a couple bought an empty, roofless concrete water tower in the middle of nowhere and built a house around it. However, last night's elderly couple building a fully automated modern bungalow to last them into their very old age were worth seeing also. As always the project went over time and over budget, but in the end Kevin gave it the seal of approval. You know... I just didn't enjoy The Hollowmen as much this week. I'm sure the intricacies of the pharmaceutical benefits scheme and the connection between powerful drug manufacturers and governments are ripe for satire, but this didn't seem to pay off here. I think the mark of a good half hour comedy is that when it finishes, you look at the clock and think how quickly the half hour went by. That certainly didn't happen with this episode sadly. Interesting to chat with my aunt today who works in the Queensland public service. She said she and all her colleagues are avid watchers of the show and just can't believe how accurate it is in the depiction of the creaking processes of government and policy. And that was the week of television. I did catch a few Antiques Roadshows after work, as well as the news, Spicks and Specks, Top Gear and some more Paralympics early in the week. But really, there was nothing else that was particularly compelling. DVD wise I watched a quite poor and boring episode of My Family with a Halloween theme, as well as an early episode of All Creatures Great and Small. The latter reinforced that despite the passage of time since its production, the quality of the writing, especially in the relationships between the three vets has not diminished. Robert Hardy as the eccentric Siegried and Peter Davison as his brother Tristan are so delightful to watch. This afternoon I plan to complete my Back to the Future trilogy watching with the third movie. It's back to the wild, wild west! Why aren't you reading Foucault? Anne and I presented our previously postponed research seminar today. It was lovely to have such an appreciative audience both here in Bundaberg and at other campuses. Over the past two years, Anne Monsour and Wendy Davis at CQU Bundaberg have engaged in a number of collaborative and scholarly activities, including reading Foucault's Discipline and Punish. In this presentation, they will discuss the background and motivation for participating in such research based activities, the outcomes and results in terms of their own research practice, and why they believe it is important for such collaborative activities to be part of academic life at a regional university. In response to Roger's comment I have expanded the post to adequately present the topics covered on the day. What we both thought was really important was that we read this so-called "theory" not just for theory's sake. It is interesting and valuable for the very reason that it can be applied in some way to real events and practices. For instance Anne found many resonances for her own work on the Australian-Lebanese migrant experience. I have used it in my writing on television. Wendy: Over the past few years Anne and I began working together in CQUniversity's STEPS (Skills for Tertiary Preparation Studies) Program. With Anne teaching Language and Learning and myself teaching Tertiary Preparation Skills, we found ourselves talking regularly about work and other things. In particular, as we were both experiencing the PhD process we often found ourselves talking about research. This was combined with a recognition that as researchers we led rather sedentary lifestyles (well I did anyway!) and we began doing some exercise together - walking, and sometimes swimming, in the afternoons and on weekends. All these combined activities led to increasing collegial activity, exchange of ideas, reading each other's work and general conversation around the issues of our research. While we worked in different areas (Anne in history, myself in television/cultural studies) we had a common interest in the humanities, and soon realised the benefits that could be gained from formalising this research activity. The clincher came in late 2007 when Anne presented her work in a university research seminar, discussing the police and government surveillance of Lebanese migrants in early 20th century Queensland. Following this, I asked (as I had done a number of times previously) whether Anne had read any Foucault. It seemed to me that Foucault's historical practice, particularly in Discipline and Punish, which concerns itself with the exercise of power through mechanisms of surveillance and observation, was peculiarly resonant with Anne's empirical studies of the Australian-Lebanese experience. Anne: Wendy and I were both researching and writing in relative isolation. We had that in common, but Wendy was a theorist and I was an empiricist. I had left university before postmodernism and poststructuralism so in terms of age and academic training, we were a different generation. Still, Wendy very kindly gave me feedback on a couple of papers and each time would make some comment about Foucault and his relevance to my work. Meanwhile, I increasingly felt that there was a whole way of thinking about and explaining the world that I appreciated yet couldn't quite grasp. When I listened, I could understand but I would struggle to explain the concepts in my own words. Finally I decided it was catch up time so the next time Wendy mentioned Foucault, I agreed to take the plunge and read whatever she recommended. Wendy: My own connection to Foucault was as a theorist whose writing on technology and power I had drawn on throughout my PhD on television. In particular I had looked at the connection between his writing on resistance and power, and the writing of Deleuze and De Certeau on power and resistance as a way of understanding a particularly televisual mode of resistance - what I called "inhabited resistance" - a complicit and pragmatic mode of operating from within an operation of power. In other words, I was already something of a Foucault convert. Anne: When Wendy suggested we read Discipline and Punish I was excited to be embarking on a new intellectual challenge but a little apprehensive that it would all be beyond me. After all, I had managed to get through several decades of life, study and research without Foucault. Still, I trusted Wendy, and Geoff Danaher's assurances that getting to know Foucault would make my life more complete and would particularly inform my research and writing. Moreover, I knew I was really fortunate to have Wendy going through the book with me, particularly because of her ability to explain difficult concepts clearly. (Wendy notes: Anne actually said this, she is being very kind!). Wendy: What was interesting for me in reading Discipline and Punish with Anne (a historian) is that it highlighted Foucault's fairly idiosyncratic historical practice. Not being trained as a historian, but rather coming to Foucault through cultural studies, I had not considered whether Foucault's episodic, yet highly empirical historical practice was unusual. It was only in having the contrasting point of view reading alongside me that this was sharply brought into focus. So apart from the specifics of Foucault's method and what he achieved in the writing of Discipline and Punish, this made a broader point about the value of collaborative reading - particularly in terms of widening one's appreciation and understanding of particular works. Anne: I was a complete novice when it came to Foucault. It wasn't that I had not heard of him. Indeed several years ago, someone had highly recommended him to me and even given me the three volumes of The History of Sexuality. But I had put them away...I was too busy to read Foucault. What changed? Well, Wendy's recommmendation of Discipline and Punish and her offer to read and discuss the book with me was a powerful incentive. So too was the feeling that there was a gap in my intellectual education that I could no longer afford to ignore. Thanks to the global economy, I obtained a copy of the book from amazon.com and with highlighter in hand and some trepidation began. Well, I have to tell you the joke was on me. I was expecting to find this difficult, highly theoretical text and pleasantly surprised to find that Discipline and Punish was written in a dense but accessible and engaging style, and furthermore, I felt like I was reading history; not a traditional narrative, chronological history but an empirically based, original and perceptive history of the birth of the modern world. Most impressive is how Foucault takes micro details and pulls them together to create a macro perspective and even though Foucault is writing about the past, time and time again, it felt as though he was writing about the present! For me, the sections on discipline highlighted many techniques and ideas that are taken for granted in education and parenting (see p. 147, p. 149, p. 154, p. 159). I found reading Discipline and Punish transformative not so much because it introduced me to new information but because he introduced me to a new perspective, a new way of critically viewing the developments of the modern world. To write is to struggle and resist; to write is to become; to write is to draw a map: 'I am a cartographer' (Deleuze 1988, p. 44). Wendy: Again it was in the practice of reading collaboratively that the idiosyncracices of Foucault's writing style and practice were really brought into sharp relief. This time through I was often particularly struck by Foucault's evocative and sometimes poetic turns of phrase (which shamefully I had totally missed the first time round). I decided it was a book that really requires reading more than once (as is the case with so much "theory"). Because of Foucault's writing style which is intuitive, it is difficult to read the book like a formal argument where the thesis is clearly and completely stated up front and then supported with evidence in a descriptive or narrative way. Rather, the thesis evolves through his engagement with the historical evidence. He states and restates, refining and adding more detail to his argument as he goes through. He investigates andmaps...modelling a style of critical thinking and engagement with the world as it was and as it is now. The quote by Deleuze perhaps crystallises just what this writing practice is all about. For it implies that writing is a creative and productive experience. Writing marks out a territory, a shape. Writing makes real an imaginative landscape. It translates ideas and produces something entirely new. Writing can also be immensely powerful. It can effect real change in the world in which it emerges. Anne: This is definitely a book that requires more than one reading. The only point I want to add in terms of writing style is that it was often difficult to distinguish between Foucault's words and the primary sources he was quoting. Wendy: Teaching in a skills based program for some years now, it was an interesting experience to return to focus on content. That is, it was rewarding to focus on understanding just what Foucault was trying to say, as well as how he might be saying it. For me, it reinforced the fact that we must be very careful to realise that skills in isolation are not sufficient. It is the combination of skill and content that should be encouraged at all levels of academic teaching and research. Anne: The benefit of interactive learning gained through the reading group reminded me of its importance in teaching and learning but also in research and writing. Wendy: I also quickly realised that it is of vital importance to regularly practice thinking and writing to maintain a skill level. This is what we emphasize to our students...but it is something we should be modelling in our own daily and weekly practice. Without any incentive to do this - such as collaborative activity - it is sometimes difficult to maintain one's own momentum. Anne: Surely in a university environment it is important for students to see the practice of lifelong learning as modelled by academics. For example, Wendy and I often had our reading group discussions in the university library. It is helpful for students to see their "teachers" also reading, researching, writing and presenting. Wendy: In terms of the writing style Foucault uses, both of us found ourselves questioning the intensity of the scaffolding we use with our students as a result. For if you go looking for topic sentences and clinching statements you aren't going to find them here. In other words, what the book reinforced fo us is that perhaps there is no one correct way to write. Anne: Reading Discipline and Punish reminded me to think critically and the reading gorup gave me the chance to voice and to discuss these thoughts. SPecifically I was challenged to think about what we are actually doing as educators. It has reminded me to think about what we do within a wider perspective. Are we unconsciously and despite our best intentions creating "docile" bodies? Are we actually acting as instruments of surveillance and control? For example, performance evaluations can be viewed as panoptic practice. Tutors and lecturers evaluate and assess students, students, in turn, evaluate the performance of lecturers, tutors and lecturers regularly undergo performance evlauations via their supervisors and so on. Wendy: As a result of returning to Foucault I have found myself writing a paper which incorporates some of the ideas I came across during the reading process. Anne: Studying this book has given me a different framework to use in evaluting the results of my empirical research. Foucault's analysis of techniques of control have informed a paper I wrote for the Palma journal based on a presentation I did last year. These ideas and frameworkds are also contributing to the way I am thinking about the policies and practices of assimilation and multiculturalism. Wendy: And a further outcome of reading together was that we have begun our own local history project. My Life/ Our Life: Conversations with the Women of Bundaberg. What is its connection to Foucault? Well, it is a local empirical study using oral history interviews and other forms of documentation, that seeks to construct a map of the lived experience for a variety of women living in the Bundaberg region. In other words, it is a small step in creating our own local archive. Anne: And the idea grew as we were chatting over coffee one day! Something that really impressed me in Discipline and Punish was the way Foucault outlined the development of disicplinary techniques which were part of a "new technique for taking charge of the time of individual existences; for regulating the relations of time, bodies and forces; for assuring an accumulation of duration; and for turning to ever-increased profit or us of the movement of passing time' (p. 157). While I am sure we have gained much from the resulting pedagogical practice, which I could recognise as part of educational practices I have experienced and employed, let's not forget the value of practices that may not be able to be quantified and controlled but which stimulate thinking, the joy of learning and the generation of ideas. Put differently, indulging in collegial chit chat is a constructive rather than frivolous activity. When you next find yourself having to place birthday candles on a cake (say for a close relative, like for instance, your mother) make sure that all candles are stuck into the cake with the wick up and the little holder thing in the cake. Otherwise you will end up with a number of wasted candles. 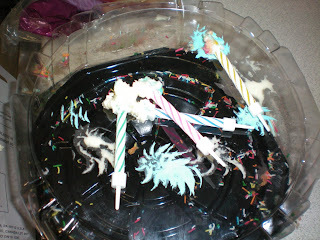 2.rearrange the candles to be evenly spaced around the cake, but end up with extra telltale holes in the icing. I'll leave to you to guess which option I chose. The upside was, however, much mirth from the other people in the room when I admitted my nitwittedness. 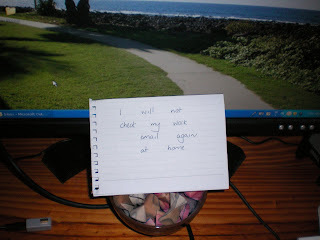 "I will not check my work email at home again"
See the very informed post at homecooked theory for a connection to my note to myself. Basically I had started to feel that perhaps it wasn't the best practice in the world to be checking work email first thing in the morning (i.e. before breakfast, showering and general waking up and easing into the day). Now thanks to Melissa Gregg's post, I can see this in a broader social context in terms of the impact of technologies like email on contemporary work practice. So far I have maintained the self-imposed ban on compulsive work email checking at home. But it's been a struggle. I have made some progress in the last week or so on "the book" and now see the need (and the potential) for another chapter that looks at We Can Be Heroes and Summer Heights High. I think this may cement further he discussion of the comic as resistance, as well as draw together the mockumentary stuff which is really only getting started during the Kath and Kim analysis. Unusually, I am sort of looking forward to writing this too. I think the Arrested Development paper gave me the impetus (and a little confidence) to write something new. So, just counting down the days now until the end of term and looking forward to some student free time to get stuck into planning and drafting. Normally I wouldn't post photos of coffee and cake, but in the aftermath of the yucky virus a couple of weeks ago I lost all taste and inclination for coffee - sad times indeed. This morning Anne and I resumed our Wednesday morning "meetings" and I managed to take this photo to mark the occasion. The break from regular caffeine means I have lost all tolerance to its effects...and now my order has gone from the slightly wimpy half-strength to the very pathetic indeed "quarter-strength.. as weak as you can make it really and still call it coffee". This is said with mild embarrassment in a quiet undertone...so no-one will point and laugh. Even that made me slightly jittery for the rest of the morning. 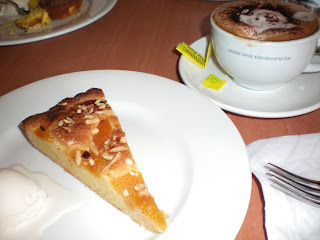 The poached apricot and almond tart was to die for though. Hardt and Negri's Multitude and Jasper Fforde's The Eyre Affair (thanks for recommendation Catriona and company at Circulating Library). I started The Eyre Affair while cooking dinner...a few pages in and I'm already hooked. Suddenly today summer seems to be in the air. The air outside is clear and warm and there's that feeling of the possibility of summer rain and storms. While I know that technically it's still spring, I often feel that here in the subtropics spring is quickly passed through and the long hot summer begins without warning. It's definitely not my favourite season, but there is something to be said for the sun rising earlier in the mornings and the day beginning with a little more ease than it seems to in the winter. It's beautiful in the late afternoons too, when it's still light but cooling down towards night. 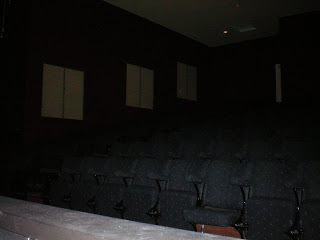 Well I finally got around to taking some more pictures up at the theatre. Mostly frontstage this time (except for this one above). 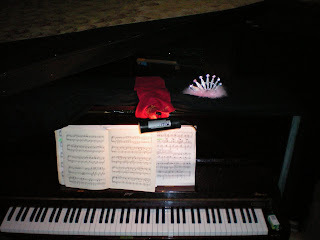 You'll note my wonderful pink fluffy tiara sitting on the piano. Friday's night theme in the pit was "bling". So in addition to my crystal sandals mentioned in an earlier post, wonderful Donna had been to the reject shop and bought some $2 tiaras. Wearing a tiara really does make you feel like a princess. Wearing a reject shop tiara makes you feel like a tacky, secondhand sort of princess. That corn really is as high as an elephant's eye. 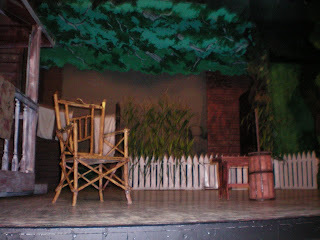 Here's Aunt Eller's chair and her butter churn...ready for the opening scene. The view from afar...well up in the auditorium anyway. This is what the audience sees. 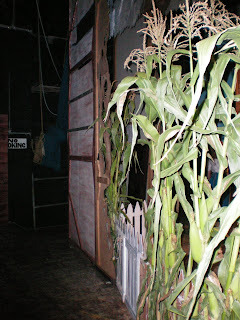 Note some cast members "walking the stage" before the theatre "goes live". Goodness but my theatrical lingo is impressive. 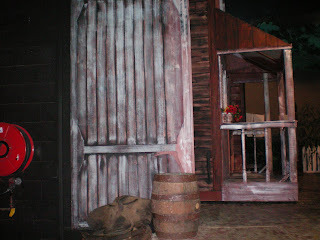 And here's a shot of Aunt Eller's little house. If you look carefully you can see she's got some healthy red geraniums in a windowbox there. I'm not sure if this would be authentic to Oklahoma but they sure do look "purty". My Oklahoma lingo is getting quite impressive too..."ain't it". What I discovered this week was that although I didn't have to go out to any rehearsals there is actually very little on the television that I want to watch. Well for creepy, freak me out, all round scariness this deceptively simple episode took the cake. I genuinely had trouble sticking it through to the conclusion and truly felt the fear of the characters and the Doctor all the way through. 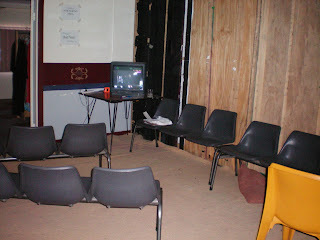 Even the loungeroom started to feel really claustrophobic by episode's end. What a sigh of relief when it was over! The Prime Minister is enamoured with the arts. He receives an invitation to Bell Shakespeare's latest production. Eating lunch at home I caught up with this old favourite. The food in the restaurant looks so yummy. I think this is the best type of cooking show because you have food and a little light drama to hold the cooking together, rather than the increasingly ubiquitous chef duos doing light hearted banter with each other over sticks of lemongrass or balsamic vinegar. This was the final episode in the series. Poor Henry Crabbe had lost his sense of taste and smell...disaster. He got it back though when he gave his annoying police job (and quasi-evil boss Freddie Fisher) the flick. Gentle and comforting TV. Other highlights this week included Top Gear on Monday. I see the new Australian version of this program is coming soon. I'm pretty sure it won't be anywhere near as enjoyable but am happy to be proved wrong. Also, Spicks and Specks as usual (not great guests this week sad to say), and the Paralympics where I was amazed in watching a Chinese swimmer with no arms swimming butterfly, breastroke, backstroke and freestyle in a medley....and doing it very well. Instead of touching the wall at lap's end he has to just hit his head and then turn and keep swimming. Surely, that's got to hurt. Impressive commitment to one's sport though. Also that wheelchair rugby is frighteningly intense. My shirt finally arrived today in the post. "Actualise the virtuality of the comic in everyday life"
I can't believe I left that sentence in. I still like it though. Yesterday while out shopping I briefly channelled my grandmother and bought two pairs of really inappropriate shoes. If they're colourful with any kind bedazzling, diamantes, glitter or beading my grandma will pounce on them and take them home (once she's paid for them of course). She's like a little bowerbird. So now I am the sort of proud owner of a pair of silver thongs and another pair of black t bar sandal contraptions with these huge fake crystal things down the centre. I'm wearing the silver thongs now. I think the attraction might be when you look down at your feet, they bring a wry smile to your face. "In spite of the lack of a clear indication of the inhabited resistance indicative of control....."
So much indicating going on there...it's a wonder I wasn't turning in a circle. "The voice seems to function to stabilise...."
Why not "The voice stabilises....."
what next...a free set of steak knives for the first 500 callers perhaps. 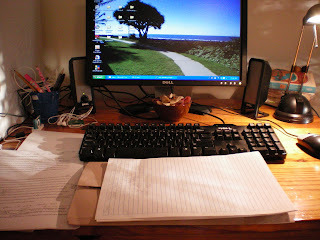 Today at work saw a return to the book revisions and writing. If you had asked how long since I had looked at this I might have said - two to three weeks. But no, the last date was 23rd of July! Anyway once I got over this little shock I busied myself with continuing through Chapter Four. This is probably my least favourite chapter. It looks at Bruce Gyngell and Graham Kennedy as Australian television sites. I still think it serves a valuable purpose in terms of a transition from my analysis of prebroadcasting images and the more contemporary sites in the later chapters, but I don't enjoy reading through it, unlike some other sections. I did manage to get right through the chapter today though and began making changes and edits on the main document. Very bravely I also printed out the APA manual in preparation for changing the entire referencing style from Harvard. It's looking like a pretty fiddly job. ho hum. 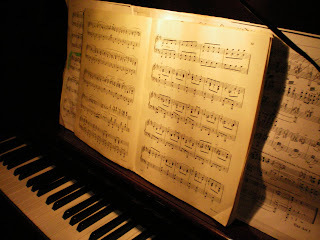 My hardworking piano student received an A for her Grade 7 exam. 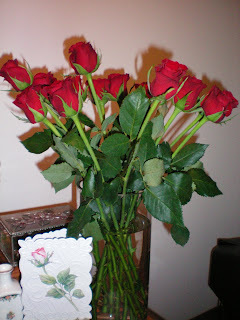 Very beautifully she brought me these pretty roses and card. Unusually for store bought roses they have a wonderful perfume. I've put them up high out of reach of the cat, who seems to have developed a flower fetish of late. On a number of occasion I walked in on him with his front paws right down in the vase. What he's trying to achieve I'm just not quite sure. I'm trusting these are out of harm's way. I've just about forgotten what it is to have Tuesday evening at home. Since July I have been at the theatre by just after 7 every Tuesday...so what does tonight hold at home? Well, not a great deal really...a bit of time on the computer, some television, later dinner and an early night. I have just managed to submit the Arrested Development paper, after spending a little time fighting with the MLA style for the reference list. I was going to wait another couple of days but then couldn't really see that would make a huge difference. So I decided just to get stuck in and get it finished. It can always come back from the reviewing process with comments etc. I'm still not sure that it won't be too abstract or general a discussion for what they are looking for, but it's good to have accomplished a newish piece of writing. Even if this journal doesn't want it, it's definitely not wasted time and may lead on to something further. This paper uses the commercial failure of television comedy Arrested Development to explore the significance of such failures for our understanding of television. Considering the disjunction between this failure and Arrested Development’s positive critical reception enables us to recognise that while the program is marginalised to some degree, it is also central to understanding the contemporary field of television. Utilising Foucault’s evocative phrase describing the “lyricism of marginality” (301) we see how Arrested Development’s mockumentary style, which is arguably connected to its commercial failure, in fact opens up a new space for future programs to occupy, transforming our understanding of television’s potential. It's suitably vague of course (as my abstracts always seem to be). But I figure if they want the detail it appears and is repeated (some might unkindly say adnauseum) in the body of the paper. The strange thing for me is that this is one of my less complex arguments...which makes it seem like I haven't done enough. I took a quiet walk around the theatre this afternoon. Once all the cast are ready they disappear out the back for vocal warm ups etc and everything gets very quiet before they open the doors to let the audience in. 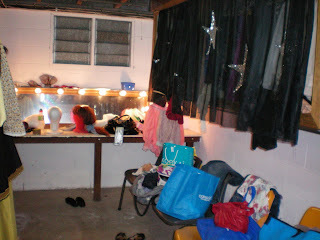 Downstairs under the stage are the well used dressing rooms. Wigs aplenty! This is the theatre in the dark before the audience pour in. In the pit ...where the instrumentalists all squish in together. 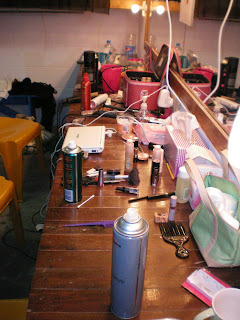 Backstage...the waiting area for when the cast aren't on the stage. It's usually in darkness during the show. 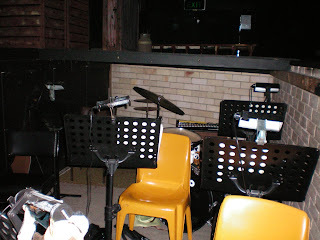 Last but not least, this is my place in the orchestra pit. Finally, after weeks of procastinating I tidied my desk and then, wonder of wonders, I actually sat down and did some work on my paper. This hasn't happened for quite some time, but with the unproductivity of last week, drastic measures were called for. It's actually good sometimes to take a break from a piece of writing and then return to it with fresh eyes. I was surprised with the section on Foucault and marginality - didn't feel the urge to rewrite it particularly. Surprised because I had written quickly in a distracted frame of mind in between lots of twiddling jobs at work. The opening sections were a little clunky, but that is to be expected when you write in a semi-intuitive fashion as I tend to. I now need to write the final section and conclusion and try and get it away by Friday. We'll see what the week brings I guess. Once again it wasn't a huge week of television for Wendy. Sickness combined with evenings out at the theatre meant not many hours in front of the box. Looking forward to a bigger week next week. I hadn't seen it before and with the house to myself I thought it was a good opportunity to catch up on some missed Pixar. Great story and beautiful animation...a joy from start to finish. Ooooh...it was the gripping second half of the library episode. I was so glad I forced myself out of my sickbed to lie on the lounge and watch this. Such wonderful ideas here regarding the space between real and virtual worlds and our understanding of them. I LOVED it. Poor sad Doctor and Donna at the end. My heart jumped when Donna's lovely husband with the stammer just missed her in the library. Sad....And that nice country house looked like a pretty good way to spend eternity as well...especially with all that clean white clothing. Midsomer Murders: I stayed on the lounge for this one, but did crawl into bed before all was revealed so I didn't find out whodunnit. Or if the detective's daughter eventually got married. Oh well. It's not must see TV but the scenery of the English villages is always attractive. Guest star in a reasonably priced car was Jamie Oliver who quite frankly seemed like a bit of a git. Maybe he wasn't really at ease on a car show. I watched a fascinating little slice of life documentary on SBS about AFL teams on King Island in Tasmania. No...really... I'm not being sarcastic or anything. The Hollowmen: I loved the little dig at the Prime Minister's eyebrows (Howard) and sideburns (Rudd). Something for everyone here. The Antiques Roadshow: Spending a lot of time lying about the house this week meant lots of time for TV that I wouldn't normally watch. Just how many people in Britain have undiscovered Faberge, priceless furniture and paintings lying under the bed? Lots, it would appear. Most enjoyable though are the experts with their eccentric personalities and interests in obscure objects. NB. Tonight, I see ABC2 is showing a science fiction film based on a Ray Bradbury story, "It Came From Outer Space". If I was going to be at home I'd be lining up for this one. Here's something I was inspired to dig out of my big box of cards and keepsakes. 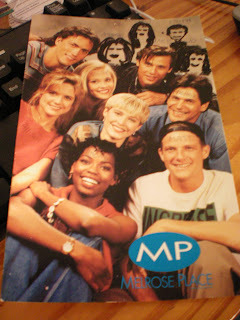 That's right, it's an extremely tasteful Melrose Place birthday card. Note the front cover where my wonderful friends drew in the missing cast members. They also labelled each person with their name across their forehead for some reason. 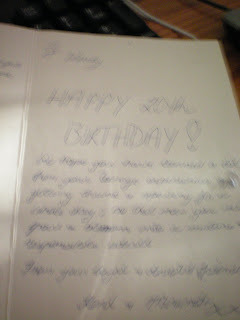 This photo came out a little blurry so I'll transcribe it for your reading pleasure. "To Wendy, Happy 20th Birthday! We hope you have learned a lot from your teenage experiences eg. getting drunk and spewing for a whole day; so that now you will grow and blossom into a mature and responsible adult. The lesson here is don't go to a party at your residential college on a Wednesday evening, the night before you have to perform in a recital. And definitely, while at the same party, don't mix drinking kahlua and milk with gin and tonics. Otherwise you too will have a revolting hangover and be unable to get out of bed for 24 hours. This put me off alcohol and milk drinks for life. Winding down in front of the television after last night's opening of Oklahoma I think I remember seeing a promo for something that was suspiciously called "90210". WHAT...are Brenda and Dylan making a comeback? Sadly, Luke Perry and his strangely aged and wrinkly forehead was nowhere to be seen. Maybe some guest appearances? But could this be 90210 for Generation Y (or whatever generational letter we are up to now). The only thing better than that would be if Melrose Place returned with Heather Locklear stirring up all kinds of trouble between the angelic Billy and Alison (before MP went REALLY stupid with the crazed Kimberley coming back from the dead or some such). Aaaah...television in the olden days...wasn't it grand. A great run through last night in front of an audience of other theatre members and friends. Tomorrow night, a sold out charity night....Then Friday night is officially opening night to the great Bundaberg public. As of the weekend about 1000 tickets already sold I think. On a recovery day from the weekend virus and rehearsal last night, I just finished watching Senator Kim Carr at the National Press Club. The Minister for Science, Innovation and Research (at least I think that's the title) it was yet another almost incomprehensible display of government speak designed to make it look like the government is doing something in each of these areas. That's the tired and cynical view anyway (which is all I feel capable of at the moment). For I'm just not convinced that phrases like "knowledge transfer" actually mean anything at all in a practical sense. This, and many other gems of public policy discourse peppered both the speech and the q and a that followed. Mentioning the "humanities" a number of times, I wasn't convinced that the Senator actually understood what the breadth of the discipline was, and it would seem they're only interested in projects that will make money...the economic imperative. Finally, using Peter Temple's The Broken Shore and Bell Shakespeare's Hamlet as his examples of artistic endeavour exemplifying the "inspirational, creative imperative" jarred severely with the tenor of the rest of the talk. Tokenistic at best. There's nothing quite like being out of action with an unpleasant virus to get life into perspective. Suddenly all commitments and responsibilities pale into insignificance as you concentrate on getting well. Things that become important are the very basics...drinking water for instance, deciding which side to lie on in bed, staring out the window and watching the sun dapple through the trees on to the lawn. I always think sickness of any kind is a little reminder to stop rushing and stressing...and once you do, there's often some small joys to be found. That was yesterday. Today, priorities were...what else to eat apart from toast and vegemite (answer: a tomato sandwich and some gatorade), getting outside into the fresh air, and this afternoon attending my piano student's exam. She played well and I'm glad I went to listen. Results in a week or so I imagine.